6 Do not be anxious about anything, but in every situation, by prayer and petition, with thanksgiving, present your requests to God. 7 And the peace of God, which transcends all understanding, will guard your hearts and your minds in Christ Jesus. Phil 4:6-7. When our hearts know that well, then our hearts will be at peace rather than in turmoil. 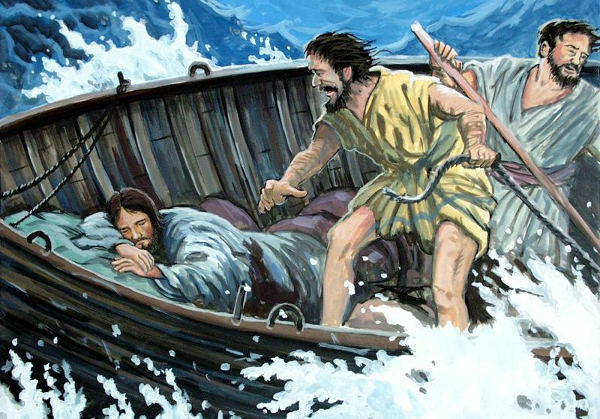 Jesus was able to sleep when the storms were raging all around him and the boat was buffeted here and there. Let’s ask him for some of that faith and confidence in God that helps us find peace. Remember verse 7 says we get peace when we are practicing what is in verse 6, so don’t forget to not worry, to rather pray and to give thanks. That’s how peace comes. I wonder if you know the story behind the hymn “It is well with my soul” – very moving, and sobering. This hymn was written after traumatic events in Spafford’s life. The first was the 1871 Great Chicago Fire which ruined him financially (he had been a successful lawyer and had invested significantly in property in the area of Chicago which was decimated by the great fire). His business interests were further hit by the economic downturn of 1873 at which time he had planned to travel to Europe with his family on the SS Ville du Havre. In a late change of plan, he sent the family ahead while he was delayed on business concerning zoning problems following the Great Chicago Fire. While crossing the Atlantic, the ship sank rapidly after a collision with a sea vessel, the Loch Earn, and all four of Spafford’s daughters died. His wife Anna survived and sent him the now famous telegram, “Saved alone …”. Shortly afterwards, as Spafford traveled to meet his grieving wife, he was inspired to write these words as his ship passed near where his daughters had died. The Spaffords later had three more children, one of whom, their only son, Horatio Goertner Spafford, died at the age of four, of scarlet fever in 1880. In 1881, the Spaffords, including baby Bertha and newborn Grace, set sail for Israel. The Spaffords moved to Jerusalem and helped found a group called the American Colony; its mission was to serve the poor. The colony later became the subject of the Nobel prize winning Jerusalem, by Swedish novelist Selma Lagerlöf.